Let's play a game... how many Jaded Blossom items do you spot in this project? Before I get started, I want to share with you something I found out during this project, and I was amazed. In my paper stack, I had a "the paper studio" stack named adhesive simplicity. (For those of you who know me, you may not be surprised by this next statement but for those of you who don't know me, please don't let it change your opinion of me) HA. I thought to myself... what a weird name for a paper pad. Who cares... it's cute! So, I pulled out this pad to use on this project and for the life of me I could not figure out why the paper was so darn thick.... DUH... it's a giant sticker! How stinkin' cool!!! A stack of 60 pages of stickers that I can make into any design I want. Yep, I'll be buying stock in this stuff! You'll see why it ended up being absolutely perfect for this project. I had such a great time making this project! These would be great little treats for your next scrap night. To start with, I used the 3x4 bags from Jaded Blossom and filled them with some cute colorful twine. 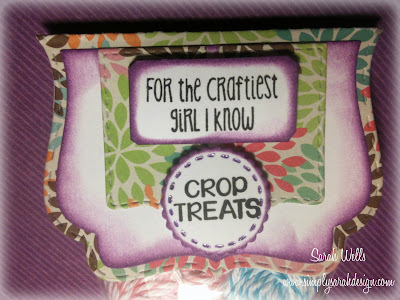 The twine had a ugly brown paper holding it in the center so I covered it up using the Candy Charms & Banner die set. I used the scalloped circle from this set. From the Craft On stamp set, I stamped the sentiments on white card stock and adhered them to the scalloped circle. Then, because the paper is adhesive, I just stuck it on top of the ugly brown paper. Then, using the Fancy Topper Die I cut out the base from the adhesive paper. I took plain white cardstock and cut out the insert then chalked it with a plum ink. On the insert after it was chalked, I used one of the banner dies from Candy Charms & Banner die set. Setting those next to each other, it added some additional layers of color. The sentiment at the top and the one in the scalloped circle are both from the Craft On stamp set also. I chalked the edges of the sentiment and the scalloped circle with the same plum and used pop dots to adhere them. The cool part of the paper you've been waiting for... I just folded the Fancy Topper Die cut out in half after it was put together, pulled the adhesive backing off and stuck it to the bag. no tape needed. So folks, that's my project for today. I was thrilled with how it came out, I hope you like it too! Super fun treat! I have some of that paper too and never used it since it is so thick. I guess I should try it. 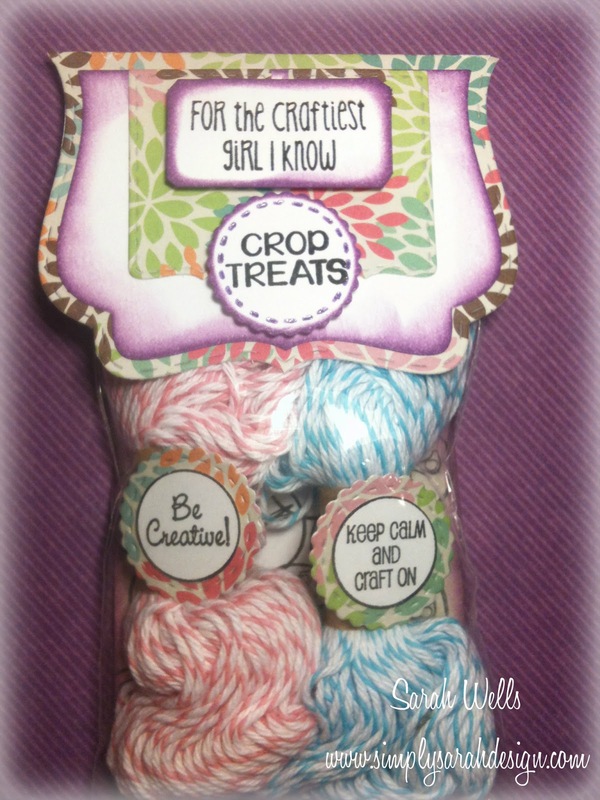 What a cool treat for a crafty friend!! This is too stinking cute!!! Love this! !